MINIMUM TERM OF BOOKING FROM 2 DAYS! 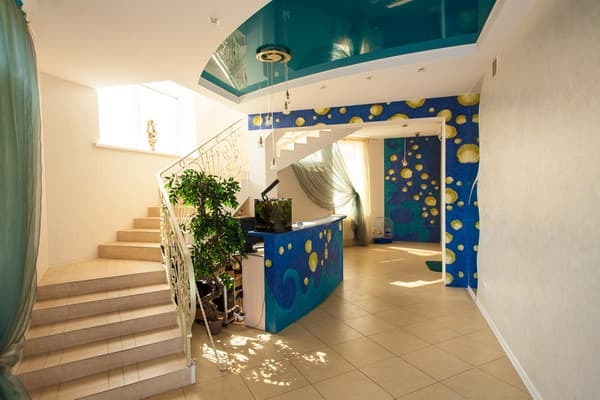 Hotel "Azov Riviera" is located in close proximity to the sea (100 meters). The hotel is located in the center of the resort village near all major entertainment centers, water park, amusement park and dolphinarium. 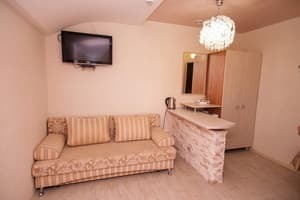 The hotel consists of 14 comfortable and comfortable rooms, the design and equipment of which meet international standards. 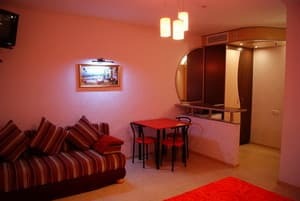 Each room has a TV, air conditioning, hairdryer, refrigerator, free Wi-Fi access. Описание номера: In the room there are two single beds with a width of 90 cm and one extra bed in an armchair. SERVICES INCLUDED INTO ACCOMMODATION PRICE: replacement of towels once every three days; Change of bed linen at least once a week; daily room cleaning; provision of iron, ironing board; visit to the tennis court (1 hour in 3 days); using the simulator; use of the brazier; solar solarium, including use of sunbeds; reference and information services. 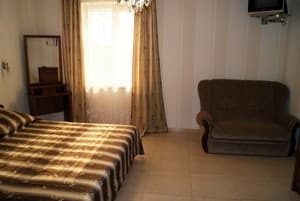 Описание номера: The room is equipped with one double bed with a width of 1.6 m (2 * 80 cm) and two extra beds on the couch. SERVICES INCLUDED INTO ACCOMMODATION PRICE: replacement of towels once every three days; Change of bed linen at least once a week; daily room cleaning; provision of iron, ironing board; visit to the tennis court (1 hour in 3 days); using the simulator; use of the brazier; solar solarium, including use of sunbeds; reference and information services. 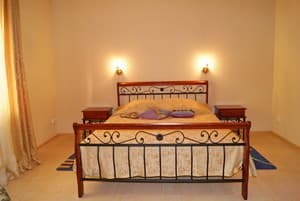 Описание номера: The room is equipped with a double bed with a width of 1.6 m (2 * 80 cm) and two extra beds on the couch. SERVICES INCLUDED INTO ACCOMMODATION PRICE: replacement of towels once every three days; Change of bed linen at least once a week; daily room cleaning; provision of iron, ironing board; visit to the tennis court (1 hour in 3 days); using the simulator; use of the brazier; solar solarium, including use of sunbeds; reference and information services. 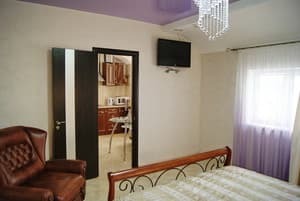 Описание номера: The room is equipped with one double bed with a width of 1.6 m (2 * 80 cm) and one extra bed on a chair-bed. SERVICES INCLUDED INTO ACCOMMODATION PRICE: replacement of towels once every three days; Change of bed linen at least once a week; daily room cleaning; provision of iron, ironing board; visit to the tennis court (1 hour in 3 days); using the simulator; use of the brazier; solar solarium, including use of sunbeds; reference and information services. 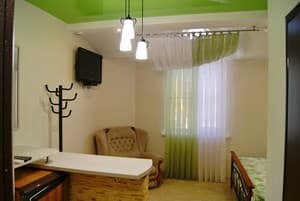 Описание номера: The room has two single beds with a width of 90 cm and two extra beds on the couch. SERVICES INCLUDED INTO ACCOMMODATION PRICE: replacement of towels once every three days; Change of bed linen at least once a week; daily room cleaning; provision of iron, ironing board; visit to the tennis court (1 hour in 3 days); using the simulator; use of the brazier; solar solarium, including use of sunbeds; reference and information services. Описание номера: In the room there is one double bed with a width of 1.8 m (2 * 90 cm) and one extra bed on the sofa. SERVICES INCLUDED INTO ACCOMMODATION PRICE: replacement of towels once every three days; Change of bed linen at least once a week; daily room cleaning; provision of iron, ironing board; visit to the tennis court (1 hour in 3 days); using the simulator; use of the brazier; solar solarium, including use of sunbeds; reference and information services. Описание номера: In the room there is one double bed with a width of 1.8 m (2 * 90 cm) and two extra beds on the couch. SERVICES INCLUDED INTO ACCOMMODATION PRICE: replacement of towels once every three days; Change of bed linen at least once a week; daily room cleaning; provision of iron, ironing board; visit to the tennis court (1 hour in 3 days); using the simulator; use of the brazier; solar solarium, including use of sunbeds; reference and information services. 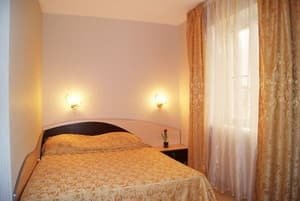 Описание номера: The room is equipped with one double bed with a width of 1.8 m (2 * 90 cm) and two extra beds on the couch. SERVICES INCLUDED INTO ACCOMMODATION PRICE: replacement of towels once every three days; Change of bed linen at least once a week; daily room cleaning; provision of iron, ironing board; visit to the tennis court (1 hour in 3 days); using the simulator; use of the brazier; solar solarium, including use of sunbeds; reference and information services. Описание номера: The room has one double bed with a width of 1.6 m (2 * 80 cm) and two extra beds (on the baby couch and on the armchair-bed). SERVICES INCLUDED INTO ACCOMMODATION PRICE: replacement of towels once every three days; Change of bed linen at least once a week; daily room cleaning; provision of iron, ironing board; visit to the tennis court (1 hour in 3 days); using the simulator; use of the brazier; solar solarium, including use of sunbeds; reference and information services. 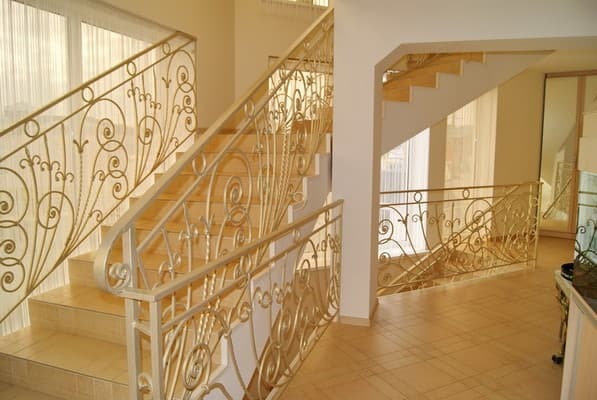 Описание номера: The room is equipped with one double bed with a width of 1.8 m (2 * 90 cm) and two extra beds on the sofa. SERVICES INCLUDED INTO ACCOMMODATION PRICE: replacement of towels once every three days; Change of bed linen at least once a week; daily room cleaning; provision of iron, ironing board; visit to the tennis court (1 hour in 3 days); using the simulator; use of the brazier; solar solarium, including use of sunbeds; reference and information services. 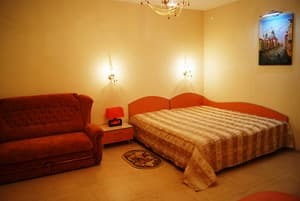 Description of the room: The room has one double bed with a width of 1.8 m (2 * 90 cm) and one extra bed on the chair-bed; in the kitchen there is a second additional place on the sofa-baby. SERVICES INCLUDED INTO ACCOMMODATION PRICE: replacement of towels once every three days; Change of bed linen at least once a week; daily room cleaning; provision of iron, ironing board; visit to the tennis court (1 hour in 3 days); using the simulator; use of the brazier; solar solarium, including use of sunbeds; reference and information services. For each additional place, including children of any age, a surcharge is charged (specify at the time of booking). 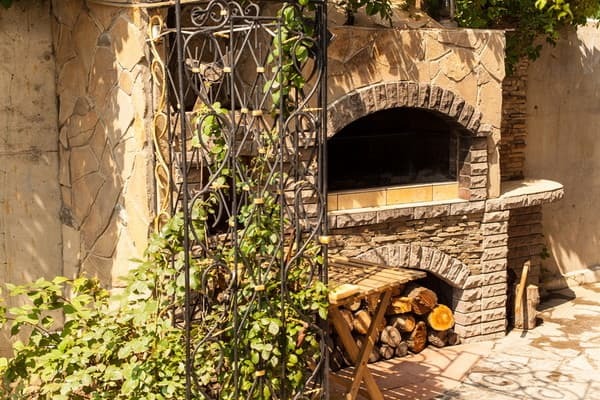 For holidaymakers of the Azov Riviera hotel complex meals are offered in the Fishka Cafe. The cost of three meals a day is 250 UAH per person per day. At the request of guests, it is possible to order breakfast, lunch and dinner separately or to eat at the free choice of dishes. 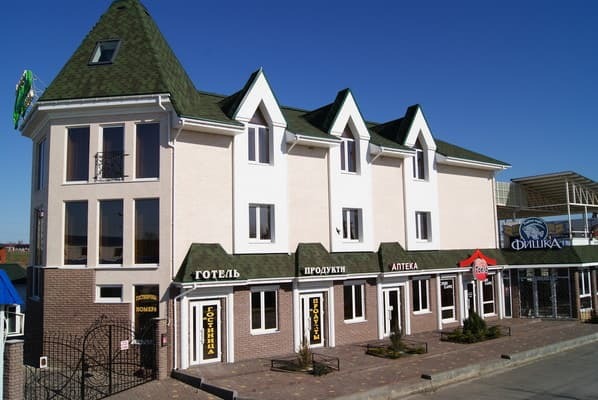 Hotel "Azov Riviera" is located in the center of the resort village of Cyrilovka, 100 meters from the sea. From Melitopol to the bus station "Kirillovka" shuttle bus or minibus (70 km). From the bus station Kirillovka bus or taxi to the Central Market, Luna Park (1 km). If necessary, for a fee, transportation from the railway station or bus station is organized. Melitopol to the hotel (the date of arrival of the train, bus - to coordinate in advance with the hotel administrator).